Winning Futures students at the HARMAN Technology Expo. 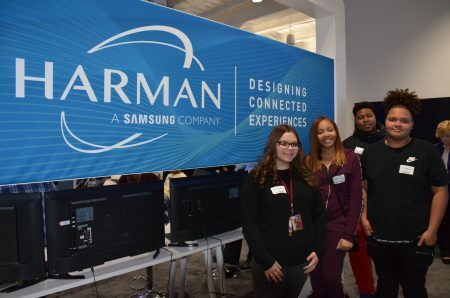 Our students from Madison and Warren Mott High Schools were invited to experience the future of automotive technology at the HARMAN Technology Expo on February 8, 2019. Click here to see photos. HARMAN designs and engineers connected products and solutions for automakers, consumers, and enterprises worldwide, including connected car systems, audio and visual products, enterprise automation solutions, and connected services. It was an action-packed day from beginning to end starting with a brief overview of HARMAN and some of the products and partnerships the company currently maintains. Our students were surprised, to say the least, when they learned about the diversity within the company’s product line, from premium audio and connected car systems to mobile software services that are connected, integrated, and secure. A highlight of the introduction was a life-sized cutout of NBA star Steph Curry, a HARMAN brand ambassador. Each student in attendance had the opportunity to tour the tech show and demo some of the current vehicle technology prototypes. At each station, students received an overview of the product and learned valuable career information from the exhibitors. The expo focused on HARMAN’s connected car portfolio, specializing in driver assistance and advanced mobility. “It’s crazy how they’re taking all the things we do on our phones and merging them into your car,” said Warren Mott High School student, Arifuz Zaman. After touring the expo there was a lunch and discussion with students and HARMAN team members. Students heard first hand from collegiate recruiters and learned about the education and skills they look for in interns and full-time employees. The day ended with HARMAN executives answering questions about the company and how they got started on their career path. Career exploration is an important part of our new Workforce Prep program – a structured and evidence-based four-year program that includes mentoring, life skill development, goal setting, and job readiness training. Our program relies on local professionals who volunteer as mentors and partnerships with supportive businesses. Click here to learn more about mentoring opportunities for the 2019-20 school year. For partnership and sponsorship opportunities, contact Julie Rayes at Julie@WinningFutures.org or 586-698-4416.